Ok so even though I bought this book before her, my mum managed to get to it quicker than I could. I posted her article about when she went to the launch of this book and met Milly and now here is her fb guest review of what is a fab book! Connie Diamond has always been her husband Jimmy's 'best girl' - or so she thought. But then she discovers that he's been playing away for the past twenty-four years, and that the chocolates she believed he bought her as a sign of his love were just a cover-up, and she is determined to get revenge. Along with Della Frostick, Jimmy's right-hand woman at his cleaning firm, Diamond Shine, Connie decides to destroy Jimmy's life from the inside. Together they will set up a rival business called Lady Muck, and along with the cleaning ladies who meet at the Sunflower Cafe, they'll make him wish he had never so much as looked at another woman. Then Connie meets the charming Brandon Locke, a master chocolatier, whose kind chocolate-brown eyes start to melt her soul. Can the ladies of the Sunflower Cafe; help Connie scrub away the hurt? And can Brandon cure her affliction and make her smile again? Review: The latest book from one of my favourite authors, Milly Johnson, had me glued to it from the very start. I devoured this one in a couple of goes, just as I would have enjoyed the afternoon teas of the title. 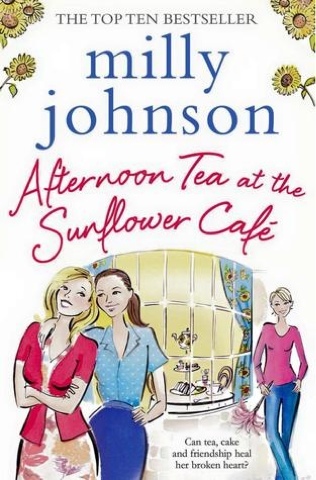 Although you might expect that maybe this is a story about a teashop, it is in fact about a group of people who meet regularly in the Sunflower Cafe, the common link between them being that they all work for the same cleaning firm and have become firm friends through that connection. So, although we do learn about how scrumptious the afternoon tea is in this particular establishment, the real story revolves around the cleaning company and the people associated with it. The main character is Connie, wife of the proprietor of the cleaning business, Diamond Shine. She and Jimmy Diamond have been married for 24 years, but she has no idea what has been going on behind her back. That is, until office manageress Della, feeling disgruntled at the way her idol, Jimmy, has rewarded her loyalty towards him, one day spills the beans. The ladies finally join forces to have their revenge on Jimmy by the most cunning of means. Jimmy is a terrible boss, cutting costs at every turn to feather his own nest and treating his workforce very shabbily. However, in the end, I felt almost sorry for him and had to focus on what he had put his good natured wife through to keep me grounded. He was not the only man in the story to come to a sticky end either. There were lots of other stories going on in the background involving some of the cleaning staff and customers, lots of them full of humour. I loved some of the character names Milly used in this story; some of the false customer names thought up as part of the ruse had me in stitches. Of course, sunflowers cropped up all over the place as well as being the name of the cafe. In short, this is a highly entertaining and engaging novel that I would recommend to anyone looking for a holiday read. If you're not familiar with Milly Johnson's books, you could do well to start with this tale. I'm now just waiting with anticipation for her next one to come along.